Each year on September 17, America marks Citizenship Day, an annual opportunity to reflect on the benefits and responsibilities of U.S. citizenship. In years past, it was used as a day to celebrate new Americans and encourage others who are eligible to become U.S. citizens. However, this year is different, as the security associated with becoming a U.S. citizen may be slipping away. A new focus on “denaturalization” by U.S. Citizenship and Immigration Services (USCIS) takes the agency’s mandate in a troubling direction. Instead of finding ways to preserve, they are devoting resources to stripping people of their citizenship. 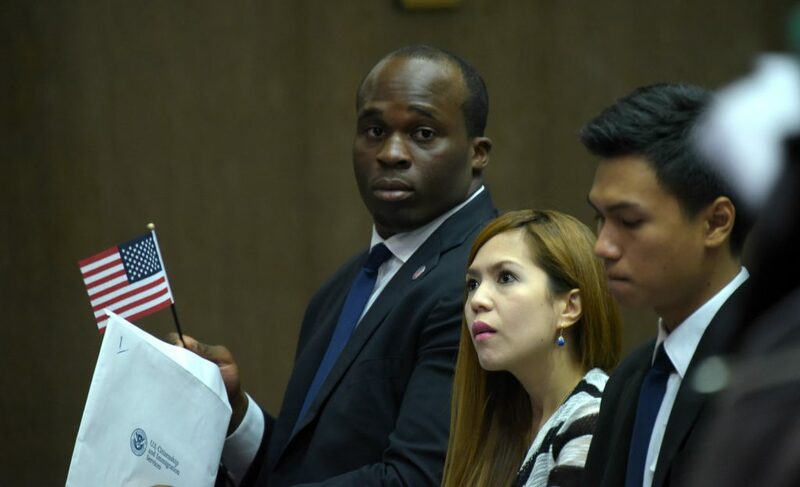 In June, USCIS Director Francis Cissna revealed the agency’s efforts to staff a new office in Los Angeles focused on evaluating whether individuals should have been naturalized in the first place. The targets of this focus on denaturalization are individuals such as Norma Borgoño, a U.S. citizen and grandmother originally from Peru. A denaturalization suit was filed against her alleging she should have revealed her role in a fraud scheme during her citizenship process—a scheme that benefitted her boss, not her—and where she cooperated with the FBI in making a case against her former boss. At the time she applied for naturalization, she had not been charged with any crime, yet the agency will attempt to use this as a way to strip her of her citizenship. The Trump administration’s decision to reinvigorate and coordinate denaturalization efforts also comes with a hefty price tag. Initiatives include Operation Second Look—an attempt to review approximately 700,000 case files of naturalized individuals to find who may be ineligible for citizenship—and Operation Janus, an initiative that formally began in 2010 where USCIS refers cases to the Department of Justice (DOJ) to pursue denaturalization. Though a 2016 government inspection detailed some improper naturalizations as a result of incomplete fingerprint record keeping by USCIS (approximately 800 citizenship grants were reportedly made to individuals who were previously ordered deported), the number of individuals stripped of their citizenship has been very low. According to some reporting, only about 300 denaturalization cases were pursued between 1990 to 2017. More information is being sought about the administration’s denaturalization efforts through requests under the Freedom of Information Act (FOIA). One FOIA request asks for documents detailing organized efforts to review naturalized citizens’ files in order to identify misrepresentations in their naturalization applications. The request highlights “denaturalization complaints” filed in the Middle District of Florida, District of Connecticut, and District of New Jersey “against two men of Pakistani origin and one man of Indian origin.” After DOJ and ICE failed to respond to the request, Muslim Advocates filed a lawsuit in federal court in Washington D.C.
Another request asks for information about the process of denaturalization review, the establishment of any new offices focused on denaturalization, and any new recommendations for denaturalization. There is a history of revoking citizenship in this country, but this administration’s hyper focus on immigration fraud gives good reason for concern that denaturalization initiatives will be overzealous and that minor mistakes in the citizenship application process may result in a person having to defend their citizenship in court. In addition, there is a great and demonstrated need for USCIS to address citizenship cases that are already pending. A recent report pointed out there has been a 35 percent increase in the backlog of citizenship applications from July 2017 to July 2018 and a 77 percent increase since July 2016. Given the extraordinarily small number of individuals against whom denaturalization cases are brought, there should be widespread agreement that the focus of USCIS resources should be on processing immigration benefits, not rooting out imaginary fraud.